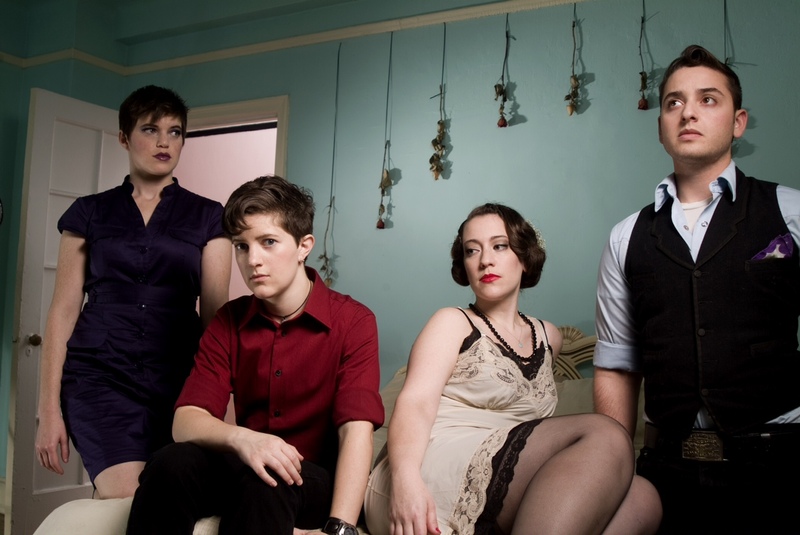 The Shondes is a Brooklyn-based indie band that has garnered attention for their gritty Riot Grrrl rock sound, Jewish influences and political messages. Comprised of Louisa Solomon, Temim Fruchter, Elijah Olberman, and Fureigh, the band has released two albums since their formation in 2006: self-released debut The Red Sea (2008) and My Dear One (2010) with Fanatic Records. The band recently made a celebrated appearance at the South by Southwest Music Festival in Austin, Texas, and has a new record in the works. I asked them a few questions about the religious roots of their music, their partnership with progressive Jewish organizations, and a general affinity for bubbe accents. Using a Yiddish word meaning “disgrace” or “shame” for a band name ties you to Jewish roots and yet separates you from religious orthodoxy. Can you speak about the name of your band, its conception, how much of it is sarcastic? Temim: When we were making lists upon lists of band names to choose from, we just kept coming back to this one! We really wanted a Yiddish name because there were such powerful and diverse connections to Yiddish language and culture in the band, and we also all related to the experience of being called a ‘shonde’ because of identity or because of speaking out about justice. We’re reclaiming it here in a way that so many people can relate to. There’s also such warmth and humor in the Yiddish language for me, and having a Yiddish band name actually really keeps me in touch with some of the laughter and the tenderness in the music we make. On a personal note, while the band name is certainly unorthodox (no pun intended!) my roots are in the Orthodox community and I still have some strong connections there. It’s very cool to me that, through this band – and actually, specifically with regard to the band’s name – I’ve been able to have some awesome conversations with other Orthodox or formerly Orthodox Jews who have struggled with being outsiders in their communities in different ways. Have your Jewish roots affected your discovery of music? Have they influenced the ways in which you express yourselves artistically? T: Speaking for myself, they certainly have! I grew up pounding my fists on the Shabbos table and harmonizing to Jewish prayers; dancing to my dad’s Jewish wedding band and loving the beautiful mournful sound of ancient liturgy. So all of that really helped to shape my deep love of music – something that, for me, is definitely quite spiritual. And of course, while we’re not a band who makes Jewish music, our backgrounds are a part of who we are and what we bring to our art. We talk a lot about the musical and cultural Jewish traditions (be they religious or secular) in our families and those conversations inform what we do in the band, for sure. And of course, we always follow a good old play-‘til-2-in-the-morning rock ‘n roll show with a bagels and cream cheese brunch for the out-of-towners, which always feels like some proud Jewish culture shining through. Can you briefly describe the inspiration behind the lyrics of “I Watched the Temple Fall”? L: We wrote “I Watched the Temple Fall” because we were thinking a lot about what Jews put our faith in, and where that faith really lives. We’d been talking about Abraham Joshua Heschel’s notion of Judaism as a religion of time, not space, and thinking about how that related to Zionism. Confining ideas into spaces (temples, states, what have you) can falsely polarize us and take us away from the big, important stuff. We wanted to write a song that clearly said, “Look, it might be devastating to face, but the state of Israel commits actions daily that violate the basic tenets of Judaism.” As a Jew, I feel I have to support Palestinian self-determination, and encourage other Jews to support their struggle for recognition as a people, deserving of human rights, statehood, citizenship, self-governance, lives free from terror. I have spent time in Palestine working in solidarity with the non-violent resistance movement there. Anyone who does that work sees the unjustifiable horror the IDF and settlers inflict, and Judaism encourages us to oppose injustice everywhere. Temim, you’ve spoken about applying the term “shonde” to the Israeli occupation. Can you elaborate upon this? How have you combined activism with music? T: When I first really started to explore my feelings about the Israeli occupation, I realized that among other things – things like being angry, being motivated to take action – I actually felt really ashamed. I couldn’t believe that such violence and oppression was being committed by Israel, supposedly in my name as a Jew. It felt – and feels – disgraceful. So that word felt appropriate to me to use. That’s also the reason that it’s really important to me to let our shows also be able to be political spaces where people can connect and have conversations about stuff like this. We’ve played shows where we’ve partnered with progressive Jewish organizations like Jews Against the Occupation and where people could learn more about the issues, or just even played “I Watched the Temple Fall” and had some really good and complicated conversations with fans afterward. Either way, I think art – and music in particular – can be both a really powerful and a really accessible way to start conversations about hard political issues. The concept of Jewish-American identity among younger generations is rapidly changing. How do you feel that you contribute to and are a part of this shifting landscape? T: I only hope we’re a part of making this landscape more expansive! I know so many Jewish people who are making their voices heard in ways that push the envelope a little bit in all the best ways, and I think that that’s incredibly important in painting an always-broader picture of what it can mean to be Jewish. It’s really exciting that we travel the country on tour and encounter so many different kinds of radical Jewish communities and identities. What’s on the horizon for The Shondes? T: First and foremost, our forthcoming new record! We cannot wait to release this one. It’s gonna be the one that makes you dance. Or at least roll down the car windows! It has been so, so much fun to make and we hope it’s just as fun to listen to. We’ll also be doing some touring, and definitely have a few other fun surprises up our sleeves for this year. I’ve seen in your YouTube videos that you all have an affinity for employing mock Jewish mother/grandmother voices. Is this something that occurs often? T: If this weren’t a print interview, I would answer this question in my best Bea Arthur voice! It DOES occur often! It’s like this Jewish bubbe lives in our collective subconscious as a band. It’s OK, though – we really like her and she makes a killer matzoh ball soup.